I’m just back from three weeks collecting ferns in New Caledonia. For a place so close to New Zealand (shorter flight time than to Australia), I knew very little about New Caledonia. I expect that is true for many New Zealanders, and it presumably reflects our very different cultures, not least being the language difference (French predominates in New Caledonia, and English* in New Zealand). New Caledonia is not an independent country but a special collectivity of France. Nouméa, its largest city, is like a piece of France transplanted to the tropical Pacific. The original Melanesian character is perhaps most strongly retained in the (north-)east. Wikipedia page on New Caledonia. Wikipedia page on the indigenous Kanak people. Some of Te Papa’s existing collections from New Caledonia. We stayed in villages during some of our trip. 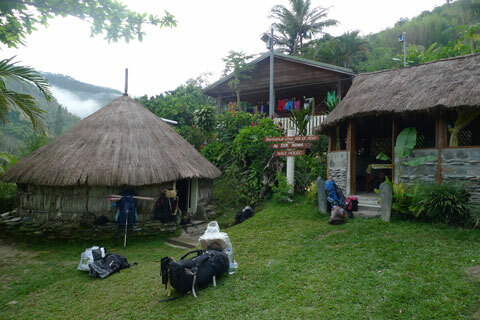 Here at Bas Coulna, before we left to climb Mount Panié, we had a traditional-type hut. Photo Leon Perrie. © Te Papa. Funded principally by a grant from the USA’s National Science Foundation, our collecting expedition was led by Matt von Konrat (Field Museum), Blanka Shaw (Duke University), and Louis Thouvenot, who was our guide and translator (none of the others in the expedition had been to New Caledonia before or spoke French, although Juan’s Spanish was useful on many occasions). The main goal was to collect Frullania liverworts, but we variously collected mosses, liverworts, and lichens – these are all small plants that are often neglected. I was invited along to collect ferns. Interview with Radio Australia’s Pacific Beat programme about the expedition. 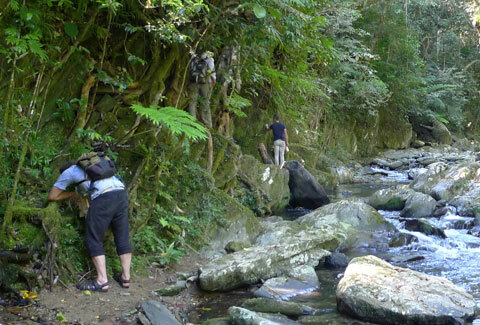 Blog post on similar expedition to Fiji in 2011. 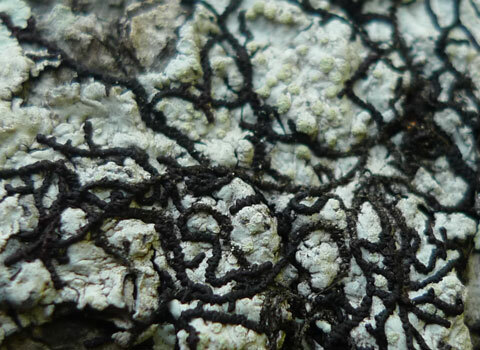 The black stems, each only about 1 mm wide, of a Frullania liverwort creeping over a white lichen on the trunk of a mangrove tree. Photo Leon Perrie. © Te Papa. New Caledonia is home to about 270 ferns and lycophytes. That’s more than New Zealand, despite a land area less than 10%. About 35% of New Caledonia’s ferns and lycophytes are endemic (i.e., only found there), which is very high for a tropical Pacific island. However, the last comprehensive account is from 1969, and it is clear that much revision is needed. A reflection of this is that there are (at least) two species of new tree fern needing scientific description. During the three week expedition, I made 232 collections, of at least 160 different species. These include new species, new records for New Caledonia, and rediscoveries (species not recorded for a long time). Te Papa’s updated checklist of Fiji’s ferns, which I hope to replicate for New Caledonia. In coming days I’ll post about some of the plants I saw, particularly, of course, the ferns. 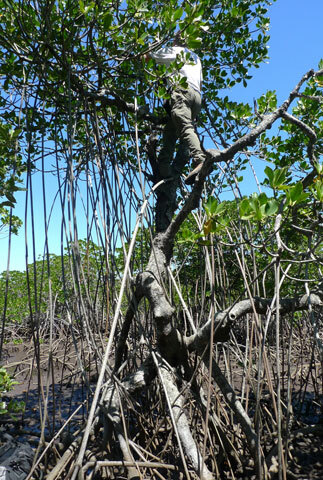 Trip leader Matt von Konrat collecting Frullania liverworts up a mangrove. Photo Leon Perrie. © Te Papa. Collecting near Tinou. Photo Leon Perrie. © Te Papa. All available space in our lodgings was often given over to drying specimens. 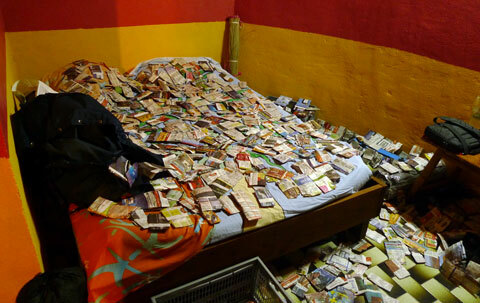 Louis’s bed is somewhere under these paper packets. Photo Leon Perrie. © Te Papa. On our way to Mount Panié. We were fortunate to have horses carry our packs for the first part of the trek. Photo Leon Perrie. © Te Papa. 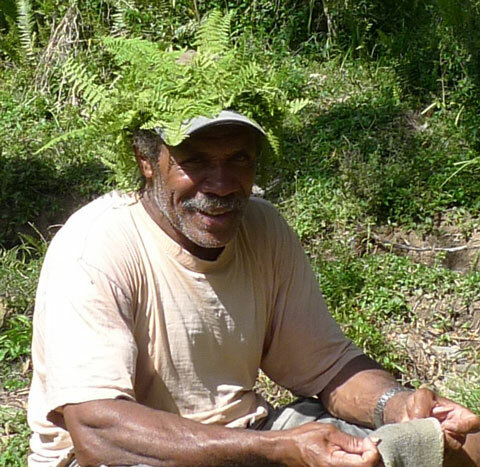 Maurice, one of our guides for Mount Panié, using a wreath of the fern Paesia rugosula to complement the shade of his cap. Photo Leon Perrie. © Te Papa. 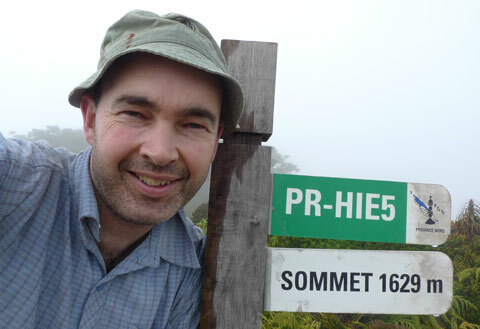 Albeit clearly exhausted, here’s proof that I did make it to the summit of Mount Panié, New Caledonia’s highest point at 1629 m above sea level. Photo Leon Perrie. © Te Papa. The expedition couldn’t have been the success it was without the assistance of many, especially Louis Thouvenot, as well as the Nouméa herbarium, the government land managers, the Kanak land owners and guides, and our contacts at Dayu Biik, Conservation International, and Société Calédonienne d’Ornithologie. I can note that the so-called ‘English’ speech of the two (monolingual) New Zealanders was constantly belittled by the other members (all multilingual) of the expedition, none of whom spoke English as a first language. Matt and I weren’t sure what to make of this. I had little to do with the logistics of our expedition, so I unfortunately can’t help too much. But, I’d suggest IRD is a good initial contact, particularly the NOU herbarium (http://herbier-noumea.plantnet-project.org/) if you’re working on plants. You will need collecting permits too, which I think are administered by the North and South Provinces. Good luck. It is a fascinating place, with a lot of biodiversity work to be done. I am interested in submitting a project to different funding institutions with field work in New Caledonia, but I am not quite sure about which institutions are most recommendable to be in touch in logistics and cooperation terms. Most of the time, it is required to have institutional contact before submit a proposal. I sought through the web for Louis Thouvenot but I didn’t find him. Some people recommended me to contact IRD, but I don’t know if P Herbarium work out better. It is possible that Dayu Biik (a collaborative organisation that manages the reserve around Mount Panie), Conservation International, and/or the herbarium might be interested in volunteer botanical help. The links are in the post above. My collecting was purely for systematics/taxonomic classification. I did make a few ethnobotanical notes around the uses of ferns, but nothing substantial and nothing medicinal. We did meet a researcher associated with the herbarium who was investigating mosses/liverworts for bioactive compounds. Thanks for the blog. 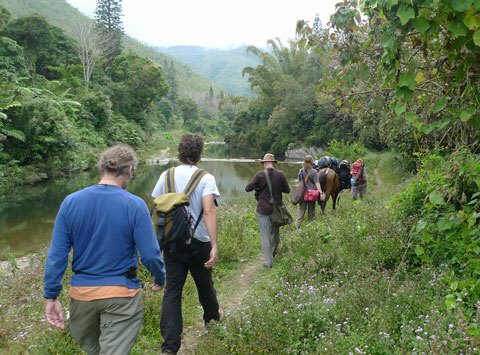 Is there a role for volunteer botanists in New Caledonia? Any medicinal research related to your trip?